Elaine Herold Bluhm's archaeological career spanned 55 years and included research, education, historic preservation, and excavations throughout the eastern woodlands. Her early efforts in Illinois archaeology influenced a generation of young professional and avocational archaeologists on the importance of preserving and learning the past through archaeology. 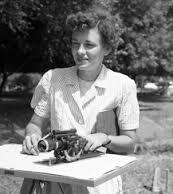 Elaine was a founding member of the Illinois Archaeology Survey in 1956 and served as its secretary-treasurer and report editor until 1967. Elaine advocated archaeological survey that tapped the potential of citizens with serious interests in local archaeology. She drew on the connections with amateur archaeologists to conduct salvage excavations on threatened sites that were not being mitigated by contract with the state highway system. Together with her faculty colleagues John C. McGregor and Charles J. Bareis, Elaine worked toward enlisting as many professional and avocational archaeologists as possible in a united effort to rescue Illinois' archaeological heritage. Funding was very unequal to the task. However, her spirit led to fieldwork into a number of areas of the state's prehistory and early history that had been neglected previously — all on a shoestring with the help of her network of dedicated avocational archaeologists. Elaine should be remembered for her selfless advocacy of fieldwork at the local-level in archaeology that included what is now known as historical archaeology. 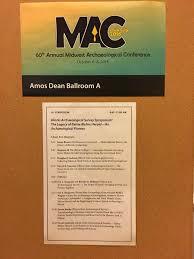 Elaine entered the graduate program in anthropology at the University of Chicago when the Midwestern archaeologist Kenneth G. Orr launched his ethno historical project to connect archaeological remains with ethnic entities. She enrolled in the university's field school for the initial year (1947) of what turned out to be a three-year project in the Starved Rock area. The venue for that year was the Zimmerman site in La Salle County. Hers was one of the student reports that many years later became combined into an edited Elaine Bluhm at the Huber site, 1953 (Courtesy of the Field Museum, Chicago) volume.1 Her experience with the project provided an anthropological perspective that shaped her subsequent career. At the time archaeology emphasized artifact typology and material culture classification to the near exclusion of anything else. Then current archaeological practice failed — in paraphrase of Robert J. Braidwood, one of her professors — to examine the Indian behind the arrowhead. Elaine took this criticism to heart in her subsequent archaeological research, most notably in her dissertation where she brought William Duncan Strong's perspective on southwestern clan formation to the study of settlement patterning. Her exposure to Kenneth G. Orr’s ethno historical project in the Starved Rock area undoubtedly stimulated her interest in the connection between the historical and archaeological record. Orr's earlier tutelage had a lasting impact on her historical perspective. I remember very clearly that Elaine remained very firm in her belief, as was Orr's, that the Langford occupation at the Zimmerman site was precontact Miami. This was before radiocarbon dates placed the occupation in the 1300s, at a problematically early time for any specific tribal affiliation. Some of Orr's research questions fed into her rescue archaeology in the Chicago area. There Dr. Bluhm directed salvage work at the Hoxie, Huber, and Oak Forest sites. Later, when funding became offered her attention turned to historic sites such as a blacksmith shop on the John Deere Co. property at Grand Detour. The investigation of the Crawford Farm site in the Rock Island area was a much larger operation. 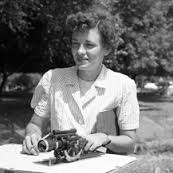 Elaine conducted salvage operations after the University of Illinois-Urbana finished a summer field school in 1959. As the site was being demolished as an interstate highway improvement she conducted additional salvage work in 1961. Critical to the scope of the operation was the cooperation of collectors and avocational archaeologists in what proved to be a large task. Crawford Farm salvage operation was important because textual documentation for the occupation was far better than those she worked at earlier. The results of this research agenda remain relevant in contemporary archaeological research of the pre-statehood period of Illinois history. Elaine received both her MA (1948) and the PhD (1957) in Anthropology from the University of Chicago. Her experience in fieldwork started in the Summer of 1947 with the Zimmerman site. In 1949, she joined the field school at Danger Cave led by Jesse Jennings. The year 1950 bought her to Tularosa Cave under the direction of the Field Museum curator, Paul S. Martin. Her master’s thesis “An Analysis of the Boulder Sites: A Study of Early Hopewell Occupation in Illinois” offered a sequence that is said to have had an important influence on the ceramic sequence adopted in the Hopewell Pottery conference held at the Illinois State Museum in 1951. Later that year she published what was the clearest demonstration of the sequence up to that time (Bluhm 1951). In 1948, Elaine was employed by the Field Museum with the task of cataloguing the textiles from Paul S. Martin’s excavations at Tularosa Cave in New Mexico. This led to her involvement in 1 Brown, James A. 1961 The Zimmerman Site, A Report of Excavations at the Grand Village of the Kaskaskia, LaSalle County, Illinois, by Kenneth G. Orr, J. Joe Bauxar, Elaine A. Bluhm, Ruth Howard, Charles E. Gillette, William H. Sears, Robert L. Shalkop, and Sara J. Tucker. Illinois State Museum, Reports of Investigations, 9. excavation and analyses of Mogollon sites in the Southwest. Her dissertation, “Patterns of Settlement in the Southwestern United States, A.D. 500-1250,” reviewed the then state of knowledge about southwestern settlement patterns during that period. By examining village layouts and their arrangements in larger communities she examined these settlement patterns in terms of social, economic and ecological factors. Elaine went on to compare these patterns of formative stage of culture in the Southwest to examples in other areas of higher culture. She married on Jan. 15, 1964 Donald G. Herold, who was the director of the Davenport Museum in Iowa until 1968. While there she wrote up the materials recovered in the nineteenth century from the Hopewellian Albany Mounds. She moved to Florida where Don was director of the Polk Public Museum in Lakeland, Florida, followed by the Museum of Arts and Sciences in Daytona Beach, Florida. They moved to Charleston, South Carolina in 1971 where he was director of the Charleston Museum until 1982. At that date, he became director of the Buffalo Museum of Science until 1984. During this period, she continued to work with local communities to rescue endangered archaeological and historical sites. All the while she taught courses as the College of Charleston, The Citadel (Charleston), the University of Buffalo and Buffalo State College. After Elaine left Illinois she became active in rescue archaeology in the state of South Carolina and then New York. She was active in the New York Archaeological Council, a professional association not unlike the IAS, and in the New York Archaeological Association, a professional and avocational organization. She is survived by one daughter Jennifer Herold. Since the 1950s Illinois archaeology has come a long way. 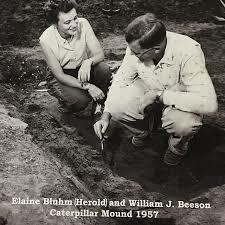 But when one reflects on the advances that have been made in the meantime, it is well to recognize that Elaine Bluhm Herold was an important figure in the initial advances made in disclosing the breadth of Illinois archaeology through excavation and analysis. She was well known among both undergraduate and graduate students for her unceasing support and assistance both in the classroom and in the field that resulted in a variety of experiences that contributed significantly to their professional careers. Elaine strove to enlist and maintain the enthusiasm of amateurs. To that goal, she became the driving force in workshops held at the Illini Union in conjunction with the Illinois Archaeological Survey annual meeting. These featured brief reports of fieldwork conducted by members of the Illinois Archaeological Survey. These days of field reports continue today and are attended by amateurs and professionals alike.